Description: This is a translation of the keyword you are tracking. Translations can be useful for cases when a user or someone viewing reports does not recognize the language of the keyword that is being tracked. Description: This is the anticipated number of users searching for this particular query. You can get this data form a search engine's keyword research tool, such as the Google AdWords Keyword Tool. Format: Search volumes can be left blank, or any integer greater or equal to zero. 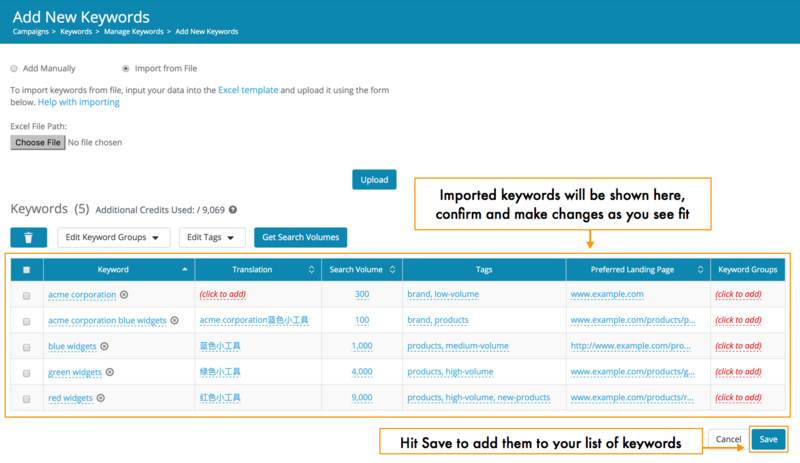 Description: Tags can be used to categorize keywords and make it easier to sort and search by group. You can add as many tags as you'd like to each keyword. Description: This field is the landing page you've targeted for this particular keyword. Once the keyword is being tracked, Dragon Metrics will compare the actual page your site is ranking for with this preferred landing page to see if they match. 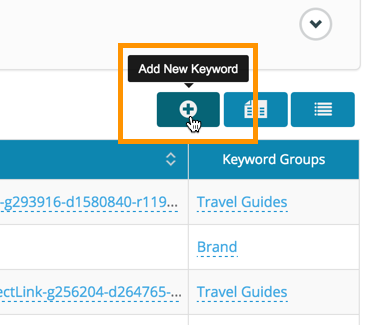 Description: This field can be used to assign keywords to different Keyword Groups that are already existing in your campaign, if you leave this column blank for a newly added keywords their rankings won't be tracked in Dragon Metrics. And the Keyword Group you've entered here must already exist in the campaign, otherwise you will receive an error when uploading your file. 4. After you have finished modifying the template, save and upload the file to the same window where you've downloaded the template and click Upload.